Since UTM establishment and over the years, UTM has been one of the largest contributors of technical and professional workforce in Electrical Engineering. In this article, we want you to meet our expert in RF and Microwave Engineering, Professor Mohamad Kamal A. Rahim. Radio-frequency engineering, or RF engineering, is a subset of electrical engineering involving the application of transmission line, wave-guide, antenna and electromagnetic field principles, while microwave engineering are the theories and devices that pertain to antennas, radar, transmission lines, space based systems (remote sensing), measurements, microwave radiation hazards and safety measures. 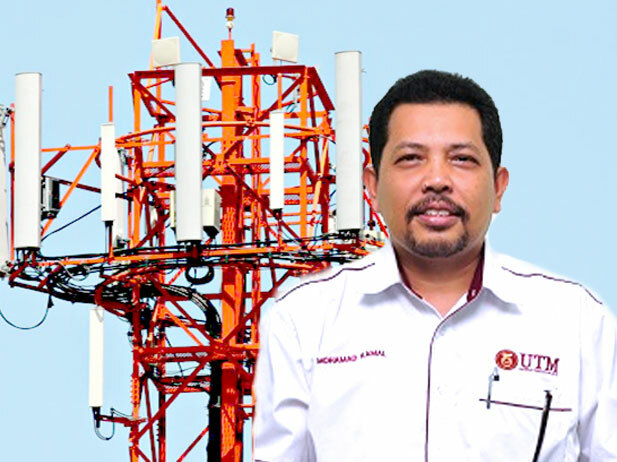 Professor Mohamad Kamal A. Rahim is a Professor in RF & Microwave and Antenna at School of Electrical Engineering Universiti Teknologi Malaysia. His research interests are in the areas of design of Dielectric resonator antennas, microstrip antennas, small antennas, microwave sensors, RFID antennas for readers and tags, Multi-function antennas, microwave circuits, EBG, artificial magnetic conductors, metamaterials, array antennas, wearable antennas, textile antenna, smart antennas, computer aided design for antennas and design of millimeter frequency antennas for 5G. Mohamad Kamal A. Rahim received a Diploma in Electrical & Electronics Engineering from Institut Teknologi MARA Shah Alam in 1984 and B Eng. degree in Electrical and Electronic Engineering from University of Strathclyde, UK, in 1987. From 1987 to 1989, he worked as a Management Trainee at Sime Tyres Mergong Alor Star Kedah and Production Supervisor at Sime Shoes in Kulim Kedah. In 1989, he joined the Department of Communication Engineering, Faculty of Electrical Engineering Universiti Teknologi Malaysia Kuala Lumpur as an Assistant Lecturer A. He obtained his M.Eng Science from University of New South Wales Australia in 1992 and PhD degrees in Electrical Engineering from University of Birmingham UK in 2003. After he received his Master’s degree, he was appointed as a Lecturer at the Faculty of Electrical Engineering. In 2005 he was appointed as a senior lecturer and in 2007 he was appointed as an Assoc. Professor at the faculty. He has published over 400 articles in reputable journals and conferences such as IEEE Antenna and Wireless propagation letters, IEEE Transactions in Antenna and propagation, IEEE Access journal, Microwave Optical Technology Letters, Progress in in Electromagnetic Research, Electronics letters and etc. He managed to secure various national and international grants such as RU Grant, CRG grant, ERGS, FRGS, PRGS, LRGS, EScience and Motorola. The total amount of the research grants that he secured is more than RM 4 million. One of his research products has been commercialized through UTM Spin off company. This is supported by UTM Symbiosis program which is the collaboration between UTM and MTDC. The total amount of grant obtained from this program is nearly RM 2 Million. Through research, which he has conducted throughout the years, he has been honoured with recognition nationally as well as internationally for the products invention. The total awards that he had received through national competition and international competition are more than 50 awards such as gold, silver, bronze and best of the best award in PECIPTA 2015. In addition, he has filed patent for more than 20 products as a principal inventor. In the year 2009, he was awarded as the best fundamental research project during CITRA KARISMA UTM 2009. Meanwhile in 2010 he was the finalist for the best intellectual property award in CITRA KARISMA 2010. In 2017 he was honoured as ‘Tokoh Penyelidik’ in Citra Karisma UTM He is the chapter chair of IEEE APMTTEMC Malaysian Section for the year 2011 and 2012. He received his excellence service award in 2004, 2011 and 2016 for his contribution towards university excellence. He has supervised more than 20 Phd students, 50 Masters which included thesis, project report, dissertation and more than 100 undergraduate students. A total of 10 Phd and 50 Master students under his supervision had graduated over the years.